Wildfires play an important role in the natural cycle of healthy forest rejuvenation. And after the fires have passed, areas of high quality regrowth and thus high quality hunting can emerge. Knowing where these burn areas are located can be an essential piece in the scouting puzzle. Our Google Earth KML downloads now include fire history for every big game unit in the west. We have organized and converted 18 years worth of GIS data going back to the year 2000. By default, the new fire history layer's visibility is turned off and you will need to check the box on its folder to see the burn perimeters. 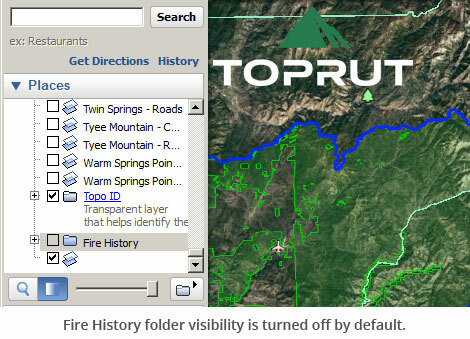 The Fire History folder is located near the bottom of the KML file folder in the Places navigation. 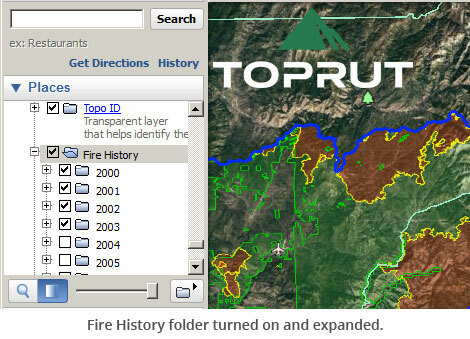 You can also expand the fire history folder where all available fires are organized by year. With the Fire History folder open, it is also possible to toggle on/off individual years if you are only interested in a particular period of time. Additionally, clicking inside of any burn perimeter will display the fire name, size and year. Fire perimeter data is traditionally tracked and recorded on multiple dates as the fire progresses. Our intent is to always find and display the last known update for each fire so that the complete perimeter is represented. But occasionally the sourced GIS data is a little disorganized, and this can lead to multiple perimeters being displayed for the same fire - one inside the other. We will continue to isolate and clean up these instances so that only the last update is shown. Happy e-scouting, and good luck in the draws!